Between Lattes: What is YOUR disease risk? Find out here. 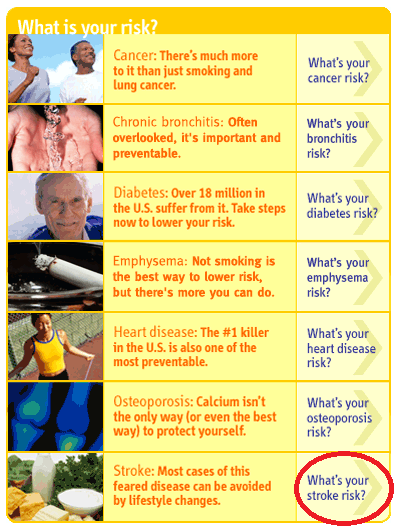 What is YOUR disease risk? Find out here. I've always held that good things are meant to be shared, especially knowledge. What I'm about to share with you here is something which I came across on the internet a few days ago. It's an interesting interactive tool developed by the Washington University School of Medicine in St. Louis, Missouri that allows you to check your disease risk, namely that of cancer, bronchitis, diabetes, emphysema, heart disease, osteoporosis and stroke. I'll provide you the link to the site shortly - but first, allow me to briefly explain how it works (please refer to diagrams). On the site, you'll find seven links - each pertaining to one of the diseases mentioned above (see Diagram 1). 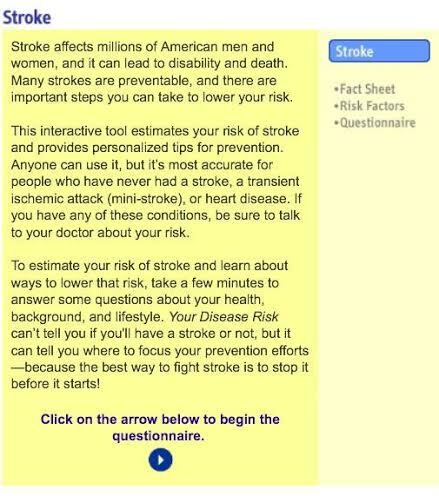 To start, click on the arrow that relates to the disease you'd like to look up (I've chosen "Stroke" in this instance). After you've done this, a fact sheet pertaining to the disease which you've chosen will appear (Diagram 2). Click on the arrow at the end of the narration to continue. Thereafter, you'll be asked a series of questions with regards your gender, age, diet, habits, etc. It's all pretty much self-guided. Now this is where it gets interesting. After you've completed the questionnaire, your screening result will appear (Diagram 3). On top of that, the site also provides useful tips on what you can do to reduce your risk of developing the disease. 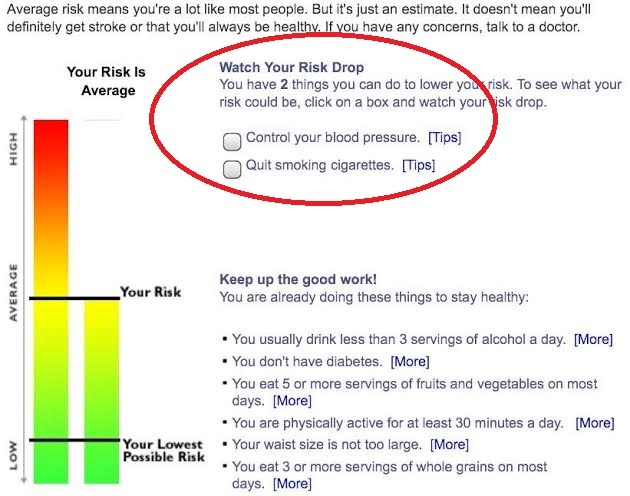 But what I particularly like about this tool is how you can, on an axis scale, watch your disease risk drop by clicking against a list of preventive measures which will be recommended to you. Now, I realise this test isn't by any measure infallible. At best, it is very general in nature and definitely not designed to specifically diagnose our individual state of health. But what it does do is provide us a rough indication of our chances of developing one (or more) of the aforesaid seven diseases. NOTHING beats having an actual health screening at a physician's or at a health lab; remember that. So, are you ready to find out YOUR disease risk? If so, CLICK HERE to proceed; you'll be directed to the Washington University School of Medicine's website where the tool resides. I hope, for all intents and purposes, you find it useful. Good luck. Did you give the test a go? If so, how do you find it? Do share this post with your friends if you find the tool useful. Good idea Vincent. As long as the information that's put in reflects reality then I think it can be used as a guild as you said. Like most things in life you can do all the right things and still drop dead. On that thought I better come and have a cup of coffee and cake!